Emphatically defending his decision to dissolve the Jammu and Kashmir Assembly, Governor Satyapal Malik on Thursday said he had done the right thing at the right time. A day after dissolving the assembly, J-K governor while briefing the media said that he had chosen Wednesday for the decision as it was Eid. “I selected yesterday for the decision (dissolution of assembly) as it was a holy day, it was Eid,” he said. The decision came shortly after PDP leader and former chief minister Mehbooba Mufti faxed a letter to him staking claim to form government in the state with support of the Congress and the National Conference. Mehbooba Mufti had reportedly written a letter to the Governor claiming support of 56 MLAs in the 87-member Assembly, but could not get it faxed. 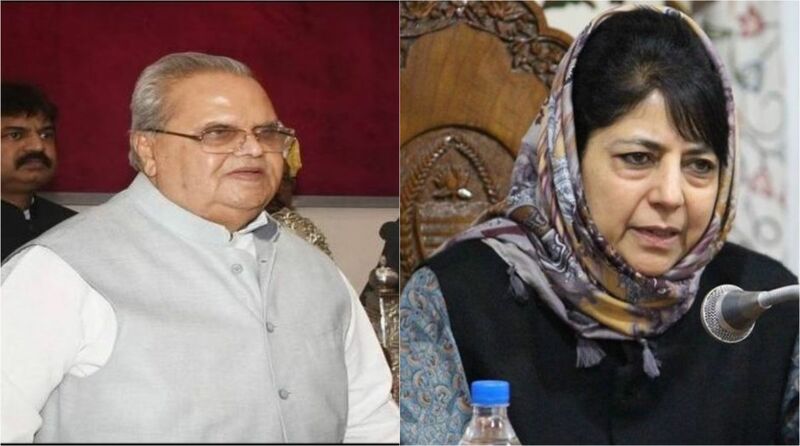 However, Governor Satypal Malik said it was Eid and none of the offices functioned on the day and therefore he had not received any fax from Mufti. But he also reiterated that his decision would not have changed even if he had received the letter. “Fax isn’t an issue. Yesterday was Eid. Both of them (Mehbooba Mufti and Omar Abdullah) are devoted Muslim and should know that offices are closed that day. Even my cook was on leave, let alone the person who handles fax. Even if I had received the fax, my stand would have been the same,” Malik told media. Mufti had earlier turned to Twitter to claim that the she had been trying to send her letter staking claim to the Raj Bhavan, which was “strangely not received”. She also said she tried contacting the Governor on phone but could not get through. In a series of tweets, Mufti thanked NC’s Omar Abdullah and Congress’ Ambika Soni “for helping achieve the seemingly impossible” and said “the very idea of a grand coalition” had given jitters, in a sharp jibe at her former coalition partner. “PS – In today’s age of technology, it is very strange that the fax machine at HE Governor’s residence didn’t receive our fax but swiftly issued one regarding the assembly dissolution,” she tweeted. Meanwhile, on reports that PDP will approach court against dissolution of Jammu And Kashmir assembly, J-K Governor said the party was free to do so. “Why will they go to court? They were demanding this since five months. I want that they go to court, it’s their right, they should go,” Governor Satyapal Malik said. The assembly was abruptly dissolved by the Governor Wednesday night hours after the PDP staked claim to form a government with the backing of rival National Conference and the Congress, followed by another bid from the two-member People’s Conference which claimed the support of the BJP and 18 legislators from other parties. The state is now headed for another spell of central rule beyond December 18 when the governor’s rule comes to an end.